Lyra Music Festival presents a Violin Masterclass with Guest Artist Ayano Ninomiya. Masterclass performers are advanced students with the Lyra Music Workshop. Praised by The New York Times as "deeply communicative and engrossing," violinist Ayano Ninomiya is committed to creating invigorating live performance experiences from concert stages to private homes and public schools. The Boston Globe wrote that, "A note from her was never just a note...Whatever project she takes on next, it is sure to be worth a listen." Equally at home as a soloist, recitalist, and chamber musician, Ayano has performed throughout the United States, as well as in Canada, Puerto Rico, Europe, China, Japan, Singapore, Indonesia, Australia, and New Zealand. In addition to recent performances at Weill Hall, Zankel Hall, and Merkin Hall, she made her Carnegie Hall debut in 2016 with the Stravinsky Violin Concerto. Recent performances include solos with A Far Cry and the Jacksonville Symphony, as well as recitals at the Music Mountain Festival, the Sembrich Opera Museum, and the Moab Festival. She will also perform with Beaux Arts Series (FL), Chamber Music International (TX), Boston Chamber Music Series, and Chameleon Ensemble (MA), as well as at the Cooperstown, Orford (Canada), Bowdoin, Morningside Music, Interlochen Arts, and Anchorage chamber music festivals. She has won numerous awards, including the Naumburg International Violin Competition, the Tibor Varga International Competition, Astral Artists National Auditions, and the Young Performer’s Career Advancement Award (APAP). As a recording artist, Ayano has released a variety of albums including a solo album of works for violin by Larry Bell and more recently, three albums as the first violinist of the Ying Quartet. In 2012 Ayano was invited to give a TEDx talk at the University of Tokyo. Other past projects include a benefit performance for victims of the 2009 Haiti earthquake, a fundraiser in the aftermath of the 2011 Tohoku earthquake with sumo wrestler Konishiki, and the creation of her own Elderhostel “Day of Adventure” programs in NYC that gave an insider's view of making music. As a recipient of the Frank Huntington Beebe Fellowship, Ayano conducted research of scores at the Bartók Archives in Budapest, Hungary. During the summers, she has performed at the Marlboro, Ravinia, Kingston, Skaneateles, Caramoor, Bowdoin, and Moab music festivals, as well as at Prussia Cove's International Musicians Seminar, the Canberra International Festival (Australia), and the Adams Festival (New Zealand), among others. She has been invited to tour France and the west and east coasts of the U.S. and France with "Musicians from Marlboro" (Marlboro Festival) and "Musicians from the Steans Institute" (Ravinia Festival). She is also a founding member of the exciting conductorless string orchestra, ECCO (East Coast Chamber Orchestra), which is composed of soloists and leaders of quartets and orchestras from around the United States. 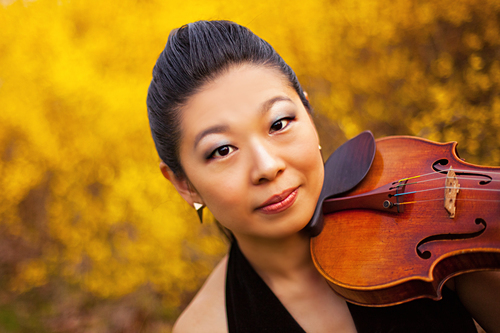 Because of her own experience beginning the violin in a public school program in Boston at the age of seven, Ayano has given numerous programs for children across the U.S. from Bethlehem, New Hampshire to Columbia, Missouri, to Denton, Maryland, including many in the greater Philadelphia area. After graduating from Harvard University and The Juilliard School, Ayano studied at the Franz Liszt Academy in Budapest, Hungary. Her principal teachers and mentors were Miriam Fried, Robert Mann, Eszter Perenyi, Michele Auclair, and Robert Levin at Harvard. From 2010-2015, Ayano was first violinist of the renowned Ying Quartet and Associate Professor at the Eastman School of Music. In the fall of 2015 she joined the faculty of New England Conservatory of Music in Boston. She has been a volunteer tutor for at-risk high school students at the East Harlem Justice Center and volunteer at the Lighthouse Music School (NYC). In her spare time, she loves to paint and practice Aikido.